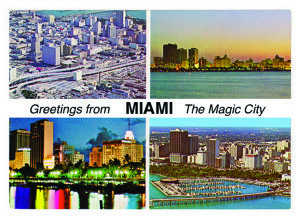 Miami + marina = Miamarina. Parker himself named the project. 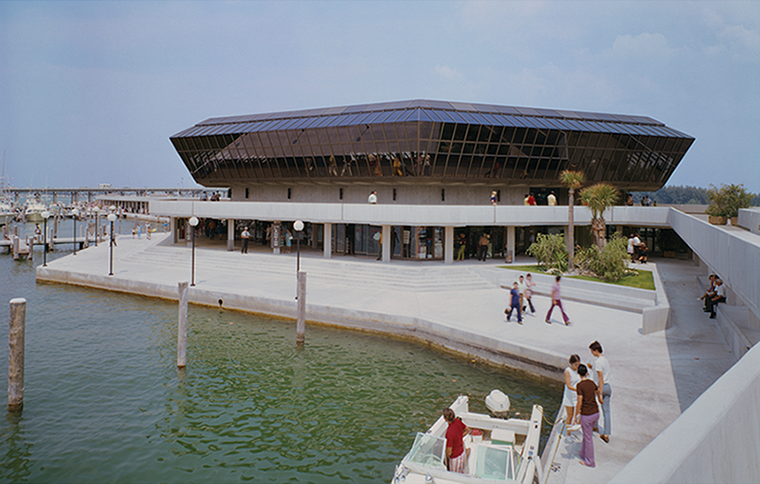 In 1967 the city council awarded Parker the commission to redesign Miami’s waterfront. With this high-profile public project architect Parker began to make his mark on his home city that he loved. Throughout design & construction the press covered the project extensively making Parker well known, not only to Miami’s arts and architecture community, but to the general public. There were skeptics about the all glass design. Many said it wouldn’t survive the high water & fierce winds of hurricanes that blow through Biscayne Bay. Parker proved them wrong. He tested Miamarina’s strength by turning a fire hose on the structure. The building’s hydrodynamic shape dispersed the powerful blasts of water leaving the building unharmed. Miamarina has stood for over 50 years, and survived two of the most devastating hurricanes in US history: Andrew in 1992 & Katrina in 2005. © Ezra Stoller @ Esto Photographics Inc, © Gulfstream Card Co., Inc.